David Dingwall with his overall champion animal which sold for £1,200, pictured with the judge Jock McCallum, Mountrich, Dingwall, and Mary-Jo Grant of sponsors, Conanvet. Two first-time exhibitors scooped the top awards at the annual show and sale of Young Farmers’ overwintered calves at Dingwall Mart. The supreme champion title, as judged by Jock McCallum of Mountrich, Dingwall, was awarded to 16-year-old Inver-Ross YFC member David Dingwall from Clashoch, Balblair, who works as an apprentice farm worker at Cloy Farm, Fortrose. 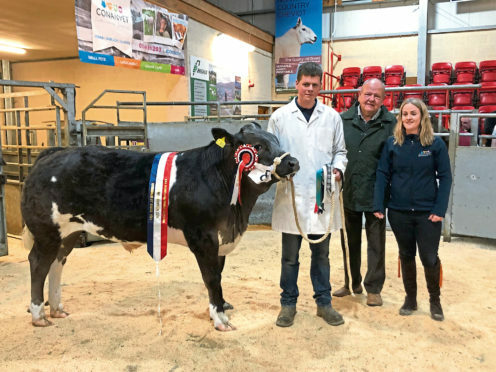 Mr Dingwall ruled supreme with a 12-month-old British Blue cross bullock bred by D Fraser, Shewglie Farm, Glen Urquhart, which he purchased last October, for £820. Weighing in at 490kg, he sold for £1,200 to Backmuir Livestock, Keith. Ross Sutherland YFC member Duncan Munro from Invercharron, Ardgay, stood home-bred champion and reserve overall with a similarly aged Limousin cross heifer scaling 470kg. Sired by Powerhouse Lynx, this heifer is out of a home-bred British Blue cross cow and sold for the top price of £1,600 to David Buchan, Savoch, Longside, Peterhead. Duncan also received £1,280 from Backmuir Livestock for a British Blue cross bullock bred at Shewglie Farm. This was his reserve haltered champion, a 495kg bullock bought last October for £920 and which is by a British Blue cross Limousin bull. At the same money when sold to Backmuir Livestock was the first prize unhaltered bullock from InverRoss member, Scott MacRae, Shawpark, Glaickmore, North Kessock. Weighing 520kg, this Limousin cross produced the highest gross margin in the competition of £480. Mr MacRae also sold another Limousin cross bullock for £1,220 to Donald Budge, Brae Edge, Murkle, this time a 500kg bullock which stood second prize in the unhaltered bullocks. Flying the flag for Nairn JAC was Georgia Fraser from Little Croy, Croy, Inverness, when she was awarded best stockperson and took the reserve honours in the home-bred section with her Limousin cross bullock weighing 495kg. He also sold to Donald Budge for £1,250. The same buyer then paid £1,200 for another InverRoss YFC member’s calf, this time Scott Dingwall’s 485kg British Blue cross bullock from Culbokie, Dingwall. Strathspey YFC member, Antonia Taylor Ramsay from the Glebe, Boat of Garten, won the best daily liveweight gain title of 1.26kg per day. The event, which was sponsored by Conanvet, Craiglands Quarry and ABP, saw 11 bullocks average 243p per kg or £1,140.91 and four heifers level at 262p or £1,142.50. Outwith the Young Farmers’ calves, the show and sale of Aberdeen-Angus and native-bred cattle attracted quality entries from the north. A 19-month-old bullock from Messrs Taylor, Ardjachie, Tain, stood Aberdeen-Angus champion and sold for £1,300 to DY Bishop and Co, Fletcherfield, Kirriemuir, while beef shorthorn champion, a heifer from Balliefurth Farm, Nethy Bridge, made £1,320 to nine-year-old Kyle Mackay, who was buying on behalf of Backmuir Livestock. Kyle attended with his mother Alana, who works for MFR Cash For Kids and has appropriately named the heifer Cash For Kids. It will be sold through the ring again at Dingwall Mart as an in-calf heifer, with all proceeds going to MFR Cash For Kids.